Last year, a photograph of Carol and Warren Reckmeyer wearing Cardinals-Giants jerseys reading "Together Since 1952" went viral. 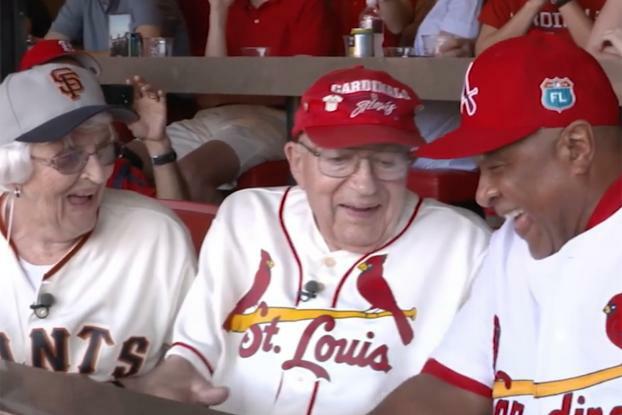 Bank of America, a sponsor of both teams, teamed up with MLB to make a feel-good video featuring the couple, inviting them to Busch Stadium for the Cards-Giants series in June for their 64th wedding anniversary. The couple pitched to the respective managers of each team and are filmed talking about their lifelong fandom and some of their baseball heroes. The video is being shared across Bank of America's social media channels, as well as MLB.com and the websites of both teams.